What can I say? It’s spring time here on the West Central coast of Florida and the bite in the Tampa Bay, St. Petersburg, Tarpon Springs and Port Richey areas is good. The weather is great (mid-80’s), and the redfish and trout are cooperating really nicely. The bite has not been the same as years past, I think due to the mild winter, but it’s been good none the less. It took a few days to figure out what was going on because the fish aren’t acting like they normally do but once we found them, they have chewed real well. The high water bite has been the best for us. Once the tide has come in, the trout and redfish have really turned on. We’ve been fishing trout on high water way in the back-country of Port Richey and Tarpon Spings and the redfish have been biting real well on the first of the leaving tide in some of their usual spring time haunts in St. Petersburg. I did fish Tampa Bay one day this week and was surprised to find redfish just about everywhere. Weedon Island has some great mid slot redfish action as well as some snook fishing action on the leaving tide. 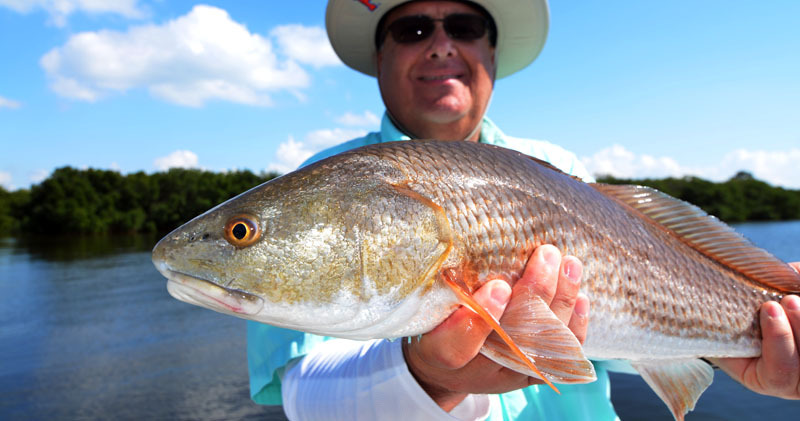 Be looking for the redfish, snook and trout to continue to be biting good as the spring progresses. But it won’t be long until tarpon start stealing the show. There are reports of tarpon already showing up in Tampa Bay and Boca Grande.